My husband love molasses cookies. In fact he loves just about anything that has the flavor of molasses. 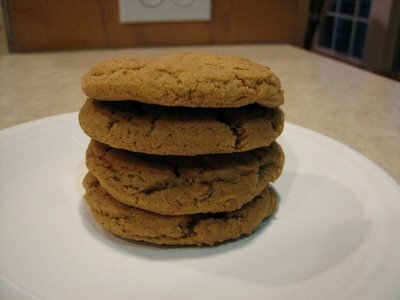 I have several different versions of molasses cookies that I make. I have been adapting my favorite recipe some. I have also add some whole wheat to it to make it a little healthier. These are really good and I will be making these often. I love having a cookie that is at least a little healthy. Preheat oven to 350 degrees. Combine the flours, ginger, baking soda, cinnamon, cloves, and salt. Set aside. In a large bowl, cream together butter and 1 cup sugar until light and fluffy. Beat in the egg, then stir in the water and molasses. Gradually stir the dry ingredients. Form into balls using about 1 tablespoon of dough. Place the cookies 2 inches apart onto an ungreased cookie sheet, and flatten slightly. I love making my baked goodies healthier. Yum, molasses cookies are soooo good! I love just smelling them as they are baking. what a great recipe — I bet the whole wheat isn’t even detectable in these cookies. Thanks for the recipe- they sound really good! a healthier cookie……I love it. Thanks for sharing…I’ll be using this. These are yummy. I made a batch this morning. The smell initially made me worry that the molasses (or black treacle that I used as it seemed the best equivalent in my cupboard) would be overpowering but they really aren’t. You cannot detect the wholewheat flour atall. Have you tried making them entirely from wholewheat flour before? these looks yummy! I have these ingredients readily available inside my kitchen cabinets and I will try cooking it today. This is one great recipe I am looking for to get my children to eat healthy but yummy foods. Thanks!